DESCRIPTION: Trophy Wallace Neff compound north of Sunset. Built in 1926 and renovated in 2007. The most sophisticated and authentic estate on the market. Complete privacy behind wrought iron gates. Two guest houses. Eight bedrooms, 9 lavish baths. Gorgeous formal gardens. Property records reveal that Miz Madonna purchased the .59 acre property on N. Roxbury Drive with it's big Wallace Neff designed house from Diane Keaton in May of 2000 for an undisclosed sum of money, although it was reported to be around $6,500,000. 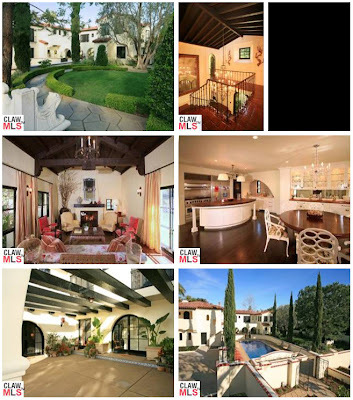 Both Madge and Miz Keaton have a history of owning architecturally significant and storied homes around Los Angeles. Miz Keaton once owned and oversaw and exquisite renovation of the old Ramon Novarro house at 2255 Verde Oak Drive in Los Feliz that was originally designed by Frank's progeny Lloyd Wright. The property was later owned (and sold) by super skinny ack-tress Christina Ricci. In the early to mid-1990s The Kabbalah Queen owned "Longdons Castle," named after the original owner Patrick Longdon. However, it is indeed more often referred to as "Castillo Del Lago." The 7,783 square foot pile, located at 6342 Mulholland Highway, is rumored to have been used by Bugsy Siegel in the 1940s as a gambling house and was sold by the music icon in 1996 for $5,300,000. Of course, everyone knows by now that when Madge is visiting Los Angeles, she and the family bed down in the big Bev Hills house on Sunset Boulevard she bought for around $12,000,000 from ack-tress Sela Ward in 2003. Listing information for the N. Roxbury property indicates that the house has been freshly renovated in 2007 and includes two luscious guest houses...plenty of room for the staff and guests that get up in your hair and bizness by staying too long...8 bedrooms, 9 bathrooms, and formal gardens. Pictures of the property are slim, but Your Mama swoons over the wood beamed living room with the fireplace as it's focal point. The kitchen, certainly well appointed with high end appliances and gadgetry isn't to our aesthetic liking, although we are sorta grooving on those wacky chairs around the breakfast table. The house is not currently owned by a celebrity. However, given the privacy, location and price, Your Mama thinks that it might be appealing to a very rich celebrity or industry type who is not interested in piloting their fat Range Rover through the twisted and narrow roads of the Hills of Beverly. Your Mama would like to thank Little Jack Horner for the heads up on on this property. "Built in 19126 and renovated in 2007"
Such a great house. I still miss the lavender "lawn" Keaton put in after the restoration -- looked amazing against the whitewashed Neff facade. it's a VERY old house anon #2. Does anyone remember that wacko that climbed the fence at the Longdon's Castle when she lived there and approached the house with a knife? Didn't one of her security guys shoot the guy? I heard that's why she moved, not that North Roxbury is much more secure. My biggest surprise is that anyone cared enough to stalk her. She bought the Castle and proceeded to paint it with big yellow and white stripes. Very classy woman. Not surprising given that her higher education was from a bowling alley in suburban Detroit. And Kaballah, or whatever that is. I agree with EJ that the Roxbury house didn't seem very secure for someone like Madonna. You don't want that L-shaped, hardly-used, heavily foliaged alley behind you if crazies are likely to lurk. I disagree about her old place in the Hollywood Hills. I liked the stripes on the house itself, which were used judiciously, mostly on its tower-like elements. Yellow accents amid a largely solid, red base. The reversed stripes on the driveway's massive retaining wall (red stripes on a yellow background) didn't work as well. I think the overall concept, which Christopher Ciccone borrowed from an Italian church, would have been better received if they'd painted the retaining wall a solid red like most of the house. anyone have pictures of this "yellow stripped house"? it sounds like you have been to this lurkey alley! This house has been 'renovated' by the last three owners (Keaton, Madonna, and the current owner). Madge was the only, one who completed an actual historic restoration of the property to Neff's original plans. She used Interior designer and Restoration expert Timothy Corrigan, who designed this years 'green' Green room for the Emmy Awards (gorgeous! ), and the Hancock Park home momma thought Toby Maguire bought recently. His work is always superlative. No telling how the current owners have add their own special 'touch' to the property. Grrrr! Can't find any online photos of the Hollywood house with its stripes intact. The photographer Tim Street-Porter has images in his book The Los Angeles House. I've never heard the former Madonna castle referred to as "Longdon's Castle". It has been "Castillo Del Lago" (Castle of the Lake, referring to it's location overlooking Lake Hollywood) for decades before Madonna's ownership. She did paint the name "Castillo Del Lago" in a decorative emblem on the striped retaining wall near the gate. If my memory serves, she moved out of the castle after the incident amid concern that the terrain around the castle made it difficult to properly secure and that made her especially concerned because of her then baby daughter. I think there was another house, in Los Feliz, between the castle and the Neff? There are photos online if you search for "Castillo Del Lago" and "Hollywood". I didn't find one that clearly shows the retaining wall though. Historynut is Historywrong. I am the current owner of the house. Madonna did virtually no rennovations to the house let alone to Wallace Neff's original plans. She did, however, remove the original front courtyard walls to move the entry to the property out to the front property lines. Madonna added on to a detached structure in the rear of the property to make an office for Guy as I was told. The rest of her work on the property was to the landscaping to secure the property from both fans and photographers. She planted a lot of large trees and hedges to prevent her family from being photographed even from the air. We removed the 10' high razor barracade around the property when we closed escrow. As soon as we did, fans from around the world were jumping the fence. Some even walked ito the house during rennovation. Most fans are respectful and just take pictures of the front gate and hedges. Some still feel the need to come into the property even though she has not lived there for years. This stalker thing is real and scary. You could not pay me enough to be famous. She did have a Wallace Neff in Los Feliz before the Roxbury house. Jenna Elfman bought it from her, and Katie Sagal (Married with Children) is the current owner of that one ... I believe. Our house retains the charm of a 1920's Neff with a fresh update. It is gorgeous! Call Drew if you are a qualified buyer and come see it. The kitchen had a concrete floor with peeling sealant and a huge stainless steel "autopsy" table for an island when Madonna sold it to to the current owners. It also had about 10 huge industrial lights hanging from the already low ceiling. These were left over from Diane Keaton's remodel. The new owners rebuilt the cabinets behind the table because they were falling apart. They put in a new island that is shaped like the arch at the original front door (now in the dining room). I guess the new owners wanted the kitchen to have more warmth and charm than the city morgue. Yes it's a nice house but overpriced. The main house is 6400 sf. The detached office and guest house add about 2000 more sf. For the flats in BH it is the best thing at its price point ... if you like old homes. It's not really the flats - it's prime north of sunset. There are 5 comps in the same price range in the same north of Sunset neighborhood, none of which have the architectural or celebrity connections of this one. I think this price is pretty accurate. Nice article and great to hear from the current owner. The "Castillo Del Lago" house is actually on Mulholland HWY by Lake Hollywood and Beachwood, not Mulholland Drive as was stated. Sorry curret owner, I mistaked this residence with the Los Feliz house designed by Wallace Neff (It happens sometimes with properties designed by him). Still It is no excuse, and I offer my humble apologies. An easy mistake - there are a lot of Neff homes in celebrity hands to confuse. Re; reference to Longdon's Castle, it was known by that name for decades before psuedo-talented morons began living there. I'm always amused by the inference (not by writers here so don't take offense) that L.A. houses only became interesting when actors live there. Most of them have great histories long before these people showed up, usually to trash them. The castle was originally built by an oil cheese named Patrick Longdon and was known as Longdon's Castle by people in L.A. I'm sorry but who cares about Madonna anymore? She was a mediocre talent in the best of times and was just lucky with her marketing skills. Now she thinks she's the Duchess of Wimbleton and the reincarnation of a Jewish mystic. She's a joke. There are so many truly talented and interesting people who must be buying and selling houses. Can we find just one? Sorry, had to vent that. She's a narcissistic fraud. Now I'm finished. Thank you. Forgive me if she is doing heroic, gargantuan, anonymous philanthropy, then I'll take back the narcissis part. If her gargantuan charity work is so anonymous, than how do you know about it? And she should stop pretending she's from England. Better yet, she should stay in England. CurrentOwner.....I guess you changed your mind and decided to hold off on selling for a while? Can anyone shed any light on the fact that this property is not mentioned at all in any books on Neff. Strangely though, an identical property is described in The book 'Wallace Neff, Architect of California's Golden Age' (page 101) as the Mrs. S. C. Fertig House, but attributed to San Marino. Did he design two identical houses?